Some British people say pants for trousers. The word underpants comes from pants which comes from pantaloons. Okay wait are trousers underpants? No, underpants are under pantaloons. Some British people say pants for trousers. Never heard anyone other than Americans call trousers, pants. I have, although I can't remember where or when. It's been a while since I've lived in the UK. I've also heard people say truck for lorry. Is the word fortnight used at all in the North America (USA or Canada)? I often say fortnight and use it in my writing. I saw the local supermarket advertise an offer on 'Chips'. They are CRISPS. Even says so on the packet. Chips are the deep fat fried chips of potato. "French Fries" are the fake too skinny chips sold in Fast Food Franchises, usually controlled by parasitic international companies. Franchise means the owner puts up all the money, pays the rent but is only a "minder". The Franchise dictates suppliers, menu, style, everything. Some leading french fries have a special coating to encourage eating and drinking more. Real chips have no coating. I'm in Ireland. More people use Polish and Chinese than Irish. We mostly use 'British English' but with big variations between Belfast (in UK), Derry (in UK also called Slash City Derry/Londonderry)) Dublin (Ireland but nicknamed Western Britain), Cork, Limerick and Galway. That's the five biggest cities on the Island. Rural Kerry, Donegal, Clare, Wexford etc very different. It's very evident on the UK & Irish Media, aided by Netflix (a loss making parasite), US TV, US Cinema and (anti-) Social Media is rapidly becoming American in spelling, vocabulary and style. Perhaps in 25 years all English speakers will only be using American. My Computer has a creeping Americanization, the Email program is displaying all dates in the foolish MM DD YYYY format. ISO YYYY MM DD is best for sorting. Non-American format is DD MM YYYY, a logical ascending format. Is it American or British Imperial? What size is a cup! The standard UK imperial measure* is hardly used now and doesn't apply to ANYTHING other than baking. There seems to be various US standard "cups" for various purposes. Also a Japanese one. Also don't Americans have weighing scales for Yarn or non-liquid ingredients? We have had cheap dial type since 1950s with grams and also UK pounds & ounces. For nearly 20 years the digital ones have been cheap and have a button for grams and also UK pounds & ounces, also to zero out weight of empty bowl. * In the United Kingdom the standard cup was set at 10 imperial fluid ounces, or half an imperial pint. The cup was rarely used in practice, as historically most kitchens tended to be equipped with scales and ingredients were measured by weight, rather than volume. (There are also UK teaspoons = 5ml, UK tablespoon = 15ml). See https://en.wikipedia.org/wiki/Cup_(unit) and also https://en.wikipedia.org/wiki/Measuring_spoon to see why it's SO STUPID to post recipes on the Internet using cups, tablespoons or teaspoons. Non-liquid should NEVER use cups, tablespoons or teaspoons. @NedMarcus It's typically used when speaking to children. Eg. "Dinner is ready. Turn off fortnite and come eat." @Lady Ty is actually an expert at this particular usage. Unless of course they're sweatpants or something of that ilk. Say, does the empty space in a stairwell have a name? I'm writing a firefight between people at the top and the bottom. I'll let a native confirm, but I think that empty space *is* the stairwell - the rest are simply stairs. And would someone care to confirm? Hello? Hello? Testing? Testing? 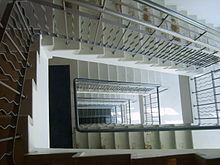 A stairwell is a vertical shaft containing (strangely enough) multiple staircases. Not really used in architecture before the early 20th century and relied upon in tower blocks. Best to be at the top in a firefight and assuming its pistols my inclination would be to lie flat away from the railings and the top step on one of the landings and shoot anyone who emerges. If I was starting at the bottom better to control the exits than chase up a very risky proposition. You are going to wind up deaf from being in an enclosed space and shooting ricochets are also an issue. A stairwell is the space in the middle. Through a couple of TV series I've come to realise that in the US, paramedics/ambulances aren't linked with Hospitals, they're linked with firefighters instead?? That doesn't make much sense, does it? ?